From Olympic venues, subway stations, and Old West towns to creepy amusement parks, Chernobyl, and the eeriest spots in the Midwest, we've toured A LOT of abandoned places (well, at least virtually). 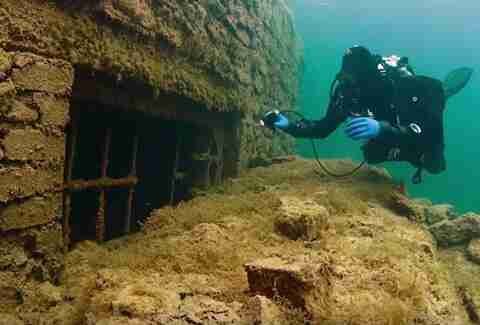 But one place we haven't ventured -- under water. Until now. Whether still submerged or only partially waterlogged, these eight drowned cities are equally haunting. 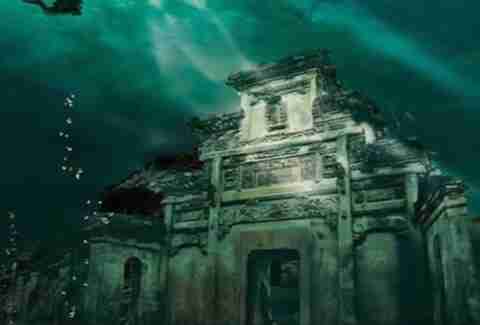 Around 100ft beneath the surface of China's Qiandao Lake sits the thousand-year-old Lion City, which was intentionally flooded by the Chinese government in 1959 to make way for a hydroelectric dam. As you do with ornate national antiquities. The huge settlement recently became accessible to visitors via several dive operators so while most tourists shuttle amongst the weird-themed islands up top (Lock Island is literally a museum of locks), you can swim amongst ancient stonework lions, dragons, and phoenixes down below. The town of Villa Epecuén was home to about 5,000 people when a dam broke in the 1980s, flooding the city with spa-like salty water from the neighboring lake. Though the town remains partially flooded today, the waters have receded enough to provide a glimpse at what your arteries look like after eating takeout Chinese food: salt-clogged and parched. 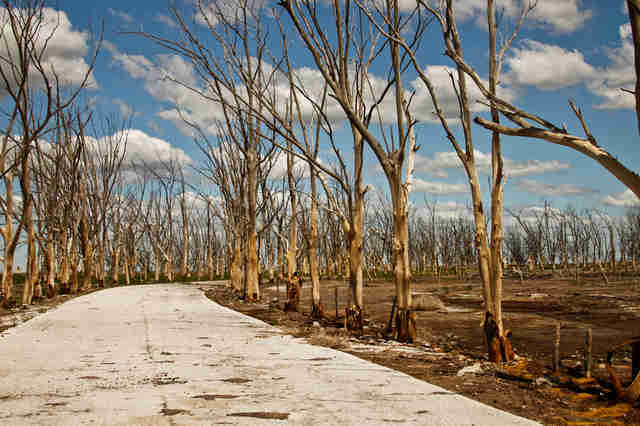 Tourists in the streets of Epecuén are treated to a buffet of petrified trees, rusty bed frames and cars, staircases to nowhere, a cemetery with exposed skeletons, and the creepy corpse of an old slaughterhouse. 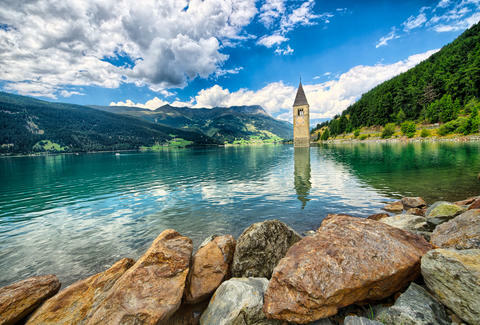 In an utterly confusing display, Northern Italy's Lake Reschen sports a 14th-century steeple sticking out from the water's surface. 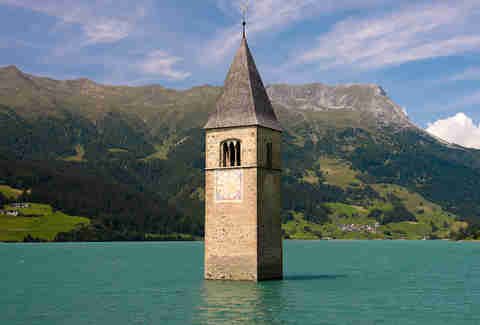 Most of the buildings in the two towns of Graun and Reschen were destroyed before the area was intentionally flooded, but the historic church tower remains -- and is even accessible by foot when the lake freezes in winter. Which is also the time of year you can apparently hear the church bells tragically tolling, despite the fact that they were removed from the tower years ago. We're not buyin' it. 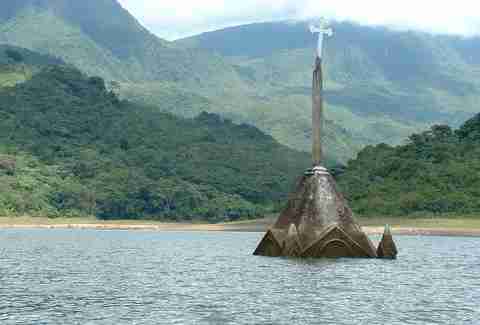 After being deliberately flooded in 1985 to build a hydroelectric dam, the drowned town of Potosí was nothing more than a crooked old cross visible above the surface of a new reservoir. But when severe drought struck Venezuela in 2008, more and more of the town church's gothic facade became exposed. 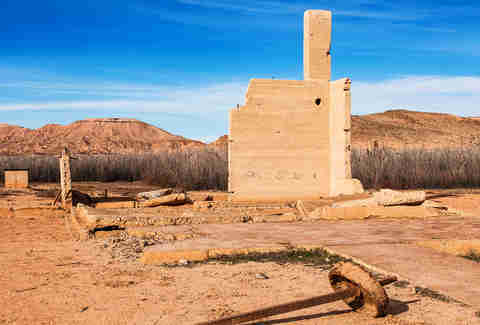 Today, it sits on dry land, surrounded by remnants of demolished houses and a cemetery. And, ironically, Venezuela is now facing a severe energy crisis. Maybe that's what you get when you drown a house of God? We're not ruling out any possibilities. St. Thomas was founded by Mormons back in the 1800s, but by the time the 1920s rolled around, the US government had begun to buy land off of local farmers and residents in anticipation of a developing situation: the Hoover Dam was being built nearby. By the late 1930s, what was once St. Thomas would be sleeping with the fishes in Lake Mead. And so it did until a drought hit just last year, and the ghost town became a land lover's reality once again. For the next few years, the curious can go check out the foundations, car parts, stairways, and artifacts left behind, before the lake eventually fills back up. Port Royal was known as the world’s "wickedest city" for a reason -- while European explorers were first checking out the Caribbean, the city at the mouth of Kingston Harbour became a one-stop shop for prostitution, booze, and pirates. Yup, real-life pirates were thoroughly enjoying themselves in Port Royal up until one fated day in 1692, when part of the town was suddenly submerged during a severe earthquake and tsunami. 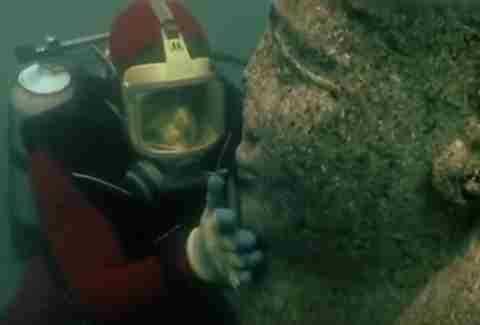 Now, several hundred sunken ships, paved streets, and fallen buildings sit below 40ft of water off of the city's coast. Want to go enjoy a day swimming and soaking up the sun at a 1930s Soviet prison camp? It's possible! The prison at Rummu sat next to a conveniently placed limestone quarry which provided plenty of busy work for its inmates. But when the prison eventually closed down, that leaking quarry turned into a bright-blue lagoon that now attracts adventure seekers and scuba divers. Submerged parts of the prison include razor-wire chain-link fences, furniture, and claustrophobic rooms with barred windows. You can even use the exposed prison structure as a diving board. Elspeth Velten is weighing the possibility of submerging her NYC apartment in salty water to kill the cockroaches. Follow her on Instagram and Twitter, and let her know if that would work.